The very first thing that people notice about your car is its outward appearance. Is it rusty looking? Dirty? Are there scratches or dings in the metal? Any car owner would want to keep the exterior of their car looking as pristine as possible, for as long as possible. Buying a ceramic coating and applying it to your car can help increase the longevity of your car’s exterior. Ceramic coatings are important to your car’s outward appearance. Not only does it help protect the paint from chipping on your car, but also helps keep your vehicle looking cleaner for a lot longer as dirt cannot find its way into pits or divots in the paint. So applying a ceramic coating to your car as soon as you get it would be the best possible solution. Depending on the type of coating you buy, it can protect your car from corrosion, resistance, and provide thermal and electrical insulation. Before you can apply a ceramic coating to your car, you first need to buy the ceramic coating if you haven’t already. There are several types of ceramic coating you can buy–Alumina-Titania, Titanium Dioxide, Zirconium Oxide, Aluminum Oxide, and Chrome Oxide. Be sure to carefully research the differences in the ceramic coating and decide which type is best for your car. The ceramic coating that you can buy is very similar to the clear coating that is already on your car when you first buy it. However, the ceramic coating is designed to be less prone to fewer swirls (when you wash your car with water) and micro-marring. Now that you have your ceramic coating, your very first step should be to completely wash and dry your car. 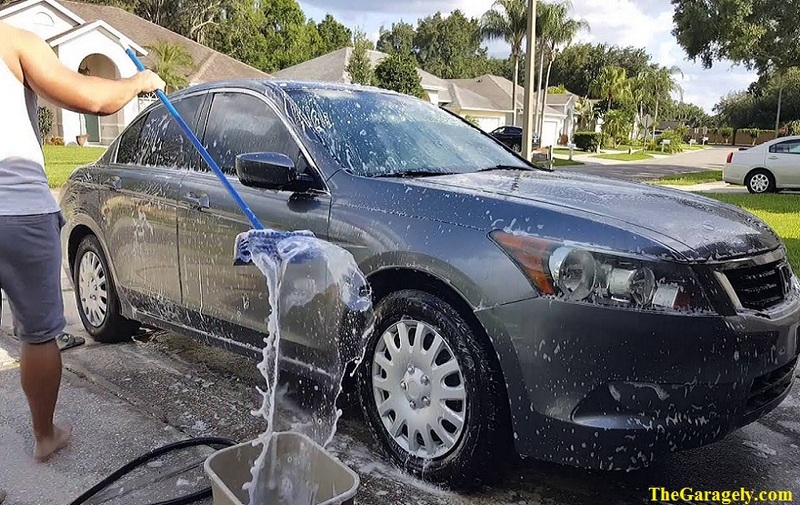 You don’t want any dirt or debris left on the exterior of your car, nor do you want any sort of wax or anything else coating the surface, as the ceramic coating will bond to your paint. It would also be preferable if you polished your car just with a plain cloth, but this is not a mandatory step. The coating should then be applied to your car, by hand, and only after it is completely cooled off. Your next step would be to apply the ceramic coating to your car, by hand, with a clean microfiber sponge cloth. 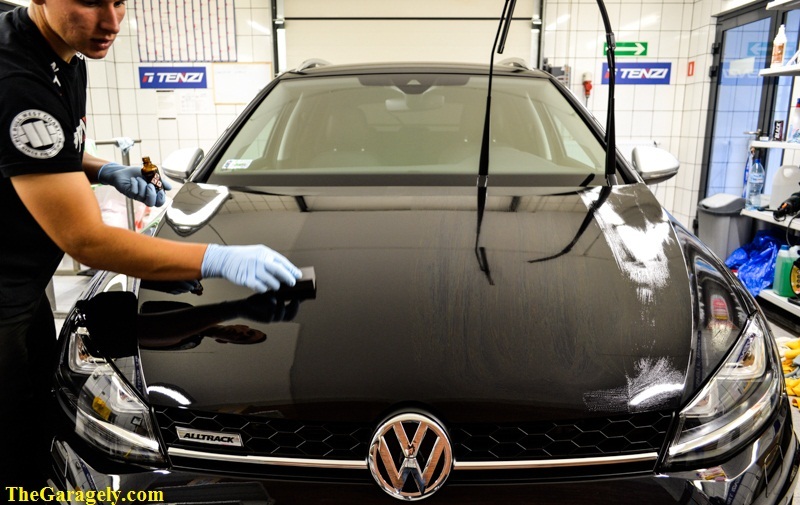 Pour a small amount of the ceramic coating onto the sponge cloth at a time, and apply in the firm, but even circles all over your car. You can also choose to apply it in a “front to back” motion. allen you feel the sponge not moving as easily over the car’s surface, then it is time to add more of the coating and continue applying. Do so until you have applied the coating to the entire car. When you have covered the entire car, use a damp rag to wipe off the excess ceramic coating, making sure to keep the coating even. Coat one panel of your car at a time, so you can inspect each panel (after waiting three to five minutes) to see how it looks, under the appropriate lighting. You may see some slight streaking from the coating that has been applied unevenly. To fix that streaking, all you need to do is gently wipe the area down with a clean cloth. Do not apply firm pressure, just keep wiping the area gently until you see the streaks disappear. Afterward, allow the coating to air dry for at least 48 hours. Do not allow it to get wet or covered in snow, as that will wreck the coating. As a side note–when you apply the ceramic coating to your car, it should not be in full view of the sun. Try for a shaded area or inside your garage, so the sunlight does not damage your car while the ceramic coating is still drying. Make sure not to apply it to the glass on your windows or side mirrors, because if it is not applied properly then it can affect visibility. Most ceramic coatings on your car will last you the lifetime of the car, so this is certainly a worthy investment in keeping your car’s exterior looking shiny and clean.